Decree of His Majesty Tsar Boris III of Bulgaria for approval of The law for protection of the nation. 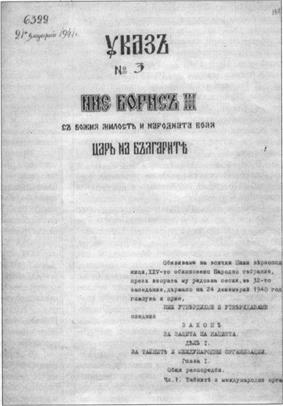 }}: Закон за защита на нацията — ЗЗН) was a Bulgarian law, effective from 23 January 1941 to 27 November 1944, which directed measures against Jews and others. 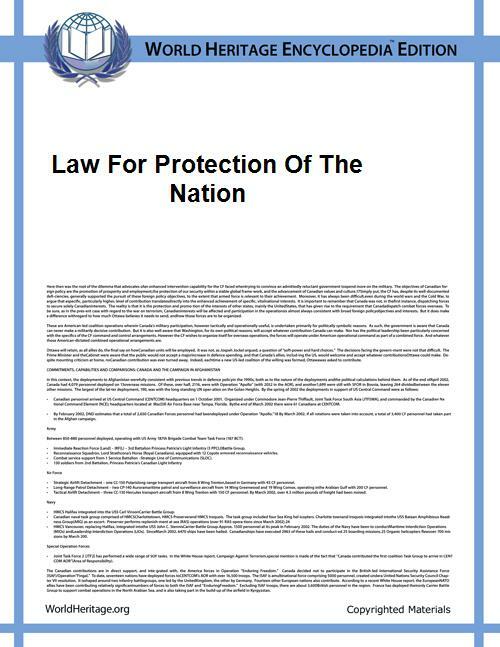 This law was passed along the example of the Nuremberg Laws in Nazi Germany. This law suppressed all Freemasonry lodges and all other secret organizations. The Law for protection of the nation, was passed under direct influence from Nazi Germany, but did not lead to the deportation of the Bulgarian Jews to Nazi extermination camps, except for the Jewish people from former Greek and Yugolavian territories occupied by Bulgaria.